Virginia. General Assembly. House of Delegates Journal of the House of Delegates of the State of Virginia, for the Session of 1863-64. Message of the Governor of Virginia, and Accompanying Documents. 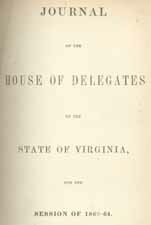 Journal of the House of Delegates of the State of Virginia, for the Session of 1863-64. Message of the Governor of Virginia, and Accompanying Documents.